So which is the best hoverboard money can buy? Well the answer to that question is “it depends”! So what are you actually asking? Are you asking “what is the fastest hoverboard, or which hoverboard is best for rough terrain or simply, which one is the coolest? In this post we are looking at the top 4hover boards (also known as self balancing scooters) of 2019 in their groupings. Now each of these products are the best for different reasons, so I am going to outline what you should be looking for initially. That which is important to find in a unit, because not all boards are the same. The details below compare the 4 products listed above as far as features and performance go. 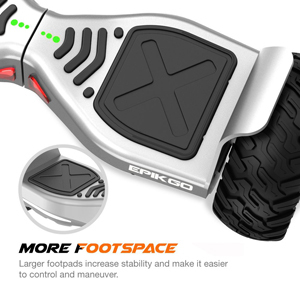 Introducing the newest unit in the Swagtron’s T series, and let me tell you that this self balancing scooter is our recommended model and in our opinion, is the best hoverboard on the market. The T6 is the first ever unit that can carry 420 lbs which means it is the perfect choice for users of all shapes and sizes. 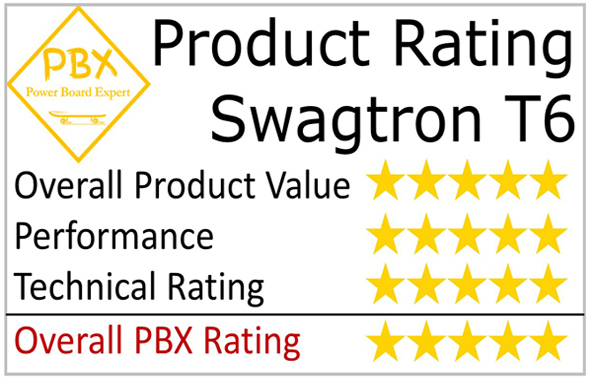 However, for it to carry that much weight, it needs to be built to meet the challenge, and Swagtron have certainly done that and have developed the most amazing product. 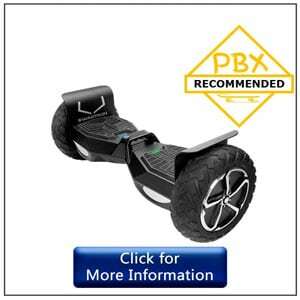 We are absolutely blown away by this board, and it ticks all the boxes as being a hoverboard that out shines any other. It is untouchable actually as you will find out in the sections below. First of all, the bad news for kids. This product weighs 32 lbs, so if you are under 8, you might struggle carrying this board around, but if mum or dad are happy to help, then you’re going to have a lot of fun on this unit. TheSwagtron’s T6 is an all-terrain unit, which means it can cope on pretty much any terrain. In actual fact, it will out perform any other unit that we know of in a like for like match on any ground. You can ride it anywhere – on the road, pavement, gravel, grass, mud or sand. It’s ability to effortlessly cope compared to other units comes down to the large size 10-inch wheels.It is well also well rated in power with its 300-Watt dual motors. Due to the wheel size, power rating and superior product build, the Swagtron T6 is able to cope with an uphill incline of up to 30 degrees which again, out performs any other unit on the market. The T6 has a high safety spec as you would expect as a follow on from the earlier high spec units in the T series. The unit is certified to UL 2271 and the batteries to UL 2272 certified. A UL certification assures you that the product is safe and it has passed all safety standards. The T6 is water resistant and can withstand a high level of water endurance ranging from heavy rain through to heavy water splash from deeper puddles. The board is not however waterproof, but no other board is either, and the T6 meets as high a standard placing it at the top performing hoverboard in the wet. The T6 uses SentryShield lithium-ion batteries. They will charge from 2-3 hours. Swagtron has a patent on the batteries they use so you can only purchase extra batteries from them, and their prices are respectable. The battery charge duration can be determined over distance travelled, and on a full charge, the T6 can travel up to 12 miles. The battery charge duration is dependent on several factors however, such as your weight, type of terrain, and how you drive. The T6 has a blue battery indicator that is easy to see whilst riding and is built in to the sides of the pedals near the central carry handle. TheSwagtron’s T6 is available in 3 different colors – matte black, desert camouflage, and pink camouflage. The matte black color is both elegant and sophisticated, however, if you are going to use the board across more enduring dusty / sandy terrains, you might want to consider one of the camouflage colors. Dust and knocks from gravel or stones will be more visible on the matte black than the camouflage, and you might like to take that in to consideration. The product has its own LED headlights and a handle that you can find in the middle. It comes with Bluetooth speakers too so you can play music straight from your phone. But the more notable feature of the T6 is that it has its own mobile phone app that you can download from the App Store or Google Play. 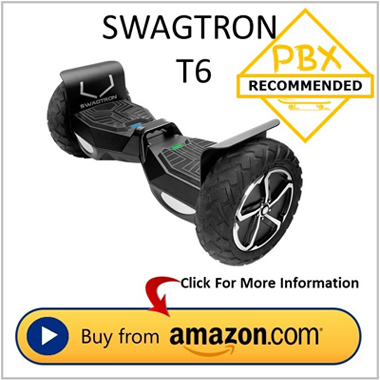 Just type “Swagtron” and download the app on your phone. This app can easily track the battery life, speed, and the distance you’ve covered amongst other features. A nice feature of the T6 are the riding modes. The unit can be set to “learning mode” for when you first start. This will help you get to grips with the unit when you start out. You can switch to “Standard Riding Mode” when you are ready and enjoy the full ability from this amazing unit. The power button is found at the back of the hoverboard as well as the port for charging. Battery indicator and the stability indicator on the unit itself, just beside the handle in the middle. The product weighs 32 lbs with dimensions of 10.5 x 25.7 x 10 inches. The maximum load it can carry is 420 lbs. The maximum speed is 12 mph. As already stated, this is our recommended self balancing scooter. 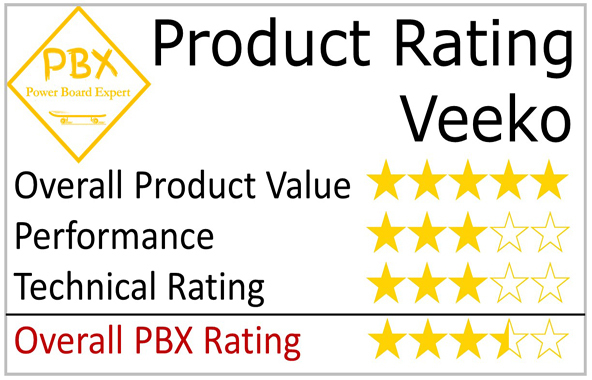 It offers the best value for money and the superior technical design and its ability to out perform any other unit on the market makes this the obvious choice of board. 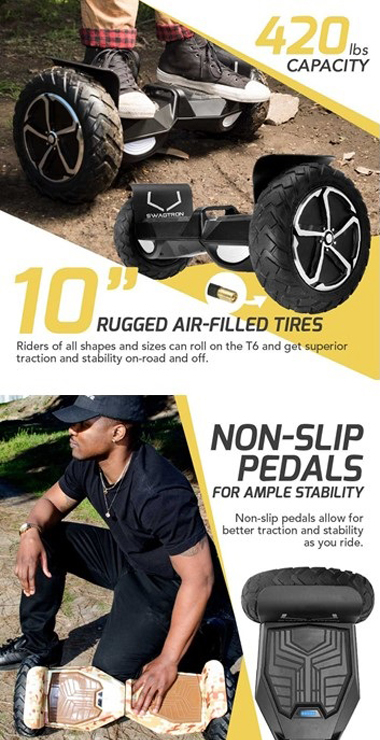 It has everything you need – all-terrain wheels, rechargeable battery & level indication, multi-functional LED lights, Bluetooth connectivity & speakers, dual riding modes, superior uphill performance, long distance duration and high-speed ability. 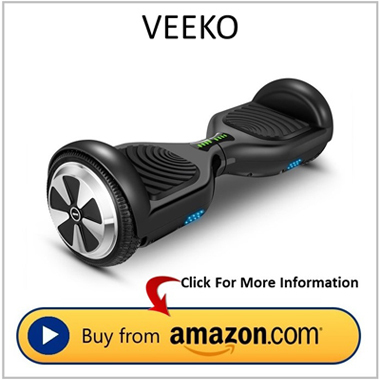 The Veekois one of the best choices of hoverboard as an all rounder, and is suitable for all ages. At the time of making this review, this product had been rated by 33 users in Amazon, 88% of which rated it as a five-star product which is impressive. Most people are happy with their purchase, and rightly so, because the unit is well constructed and has well appointed features making this a product that offers high value and one that delivers a lot of specification for a relatively low price. We only show hoverboards that are UL 2272 certified on this site, and the Veeko is fully certified, so it’s not going to explode, catch fire or anything crazy like that. Charging time takes around 2-3 hours for a full charge. Once fully charged, it can be used for 4-6 hours. However, when you fully drain the battery, the battery indicator might not light up right away even if it is already charging, so if this happens, just wait for 10-15 minutes and it will turn on eventually. The unit comes with a rechargeable battery, a power cord, and a charger as you would expect. At the back of the hoverboard you will find the power button together with a light that indicates whether or not it’s turned on and the fault indicator light. The charging port ison theright hand side next to the power button and it contains a battery level indicator. When switching on, simply press the power button and hold for about 2-3 seconds and wait for it to show a green light. To start using this product, simply turn on the power and step one foot on the pedal followed quickly by the other foot. All movements are detected by the weight and the movement of the feet. So if you want to stop, simply bend your feet slightly to the back in a manner similar to when you brake on a scooter. The Veeko comes in one color only: matte black. It is fitted with blue LED lights at the front. The lights look cool, but they don’t provide illumination to enable safe night time use. 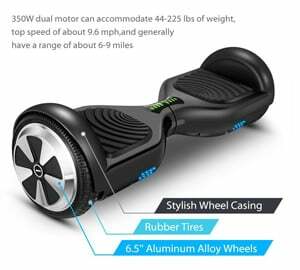 The board comes with two aluminum alloy wheels that are fitted with rubber tires and have a diameter of 6.5 inches and 1.2 inch width. The dimensions of the board are fairly typical being 22.8 inches in length and 6.9 inches in height. At 10Kg, it is reasonably light weight compared to some, but is still heavy for young children, so be aware of this about hoverboards, because some can be up to twice this in weight. It comes with a decent size dual motor rated at 350 watts which is a good size for the price of the unit. It is fitted with an acceleration sensor (accelerometer), a gyroscope and a servo-control system which are well designed features and helpful in determining your balance and acceleration. The former helps determine your orientation with respect to gravity and the latter helps to measure your acceleration based on the vibrations of the wheels. Concerning speed, it is very average, and has a top speed up to 9.6 miles per hour, but to achieve this level, the surface conditions need to be perfect, and in reality, the top speed is more realistically 6- 9 miles per hour. The range, or distance this unit will travel is around 6 – 9 miles which is rather good, and the battery duration time is also good and will last up to 90 minutes on a full charge. The recommended maximum user weight is 102 kilograms (225 lbs), which is reasonable. The unit is water resistant and built to withstand rain and going through a reasonable depth of surface water. The unit is not waterproof however, so you would be advised not to ride it through a deep puddle where the body of the unit is submerged. Color: matte black with blue LED lights in front. Rubber tires are 1.2 inches wide and 6.5-inch high with aluminum alloy wheels. At the back of the unit you will find the power button as well as the light that indicates whether or not it’s turned on and the fault indicator light. The charging port is found right beside the power button and it contains a battery level indicator. The product is 22.8 inches in length and 6.9 inches in height. The product weight is 10 kilograms. The maximum weight it can carry is 102 kilograms or 225 lbs. It is powered by a 350-Watt dual motor that can run from 6 to 9 miles per hour. It has an acceleration sensor (accelerometer), gyroscope, and a servo-control system. It comes with a rechargeable battery, a power cord, and a charger. Product warranty is 12 months. The Veeko is a best seller, and rightly so. The reason for this unit’s popularity is because it provides great value and is clearly a well designed and built product. The specification is to a good standard, and the board provides a good user experience. I would say that the Veeko is aimed at a user looking for a starter unit or someone that wants a board for typical use. It is really designed for use on reasonably smooth surfaces like a pavement or a quiet road. “Off roading” is not really for this unit, and if you wanted a more versatile board that will cater to multiple terrains, then you would need to go for an 8 or 10 inch unit. The safety standard of this unit high with the board being UL 2272 certified and its battery certified to UL 2271. The battery has passed 159 tests and is not a potential fire hazard. The battery is equipped with fast charging technology. This means it will be fully charged after 2 hours. However, the charger that comes with the board does not have an auto-charge feature, which means that it will not stop charging once the battery is full. Because the manufacturer warns against overcharging, you need to be careful and remember to always disconnect the device once fully charged, but this is no different than with most electrical devices that require charging. When charging, do not be fooled by the battery level indicator. When fully charged, it will only have 5 out of 6 lights. The 6th light comes on only if there is a problem with the battery. It has a dual motor power with a maximum speed of 12 miles an hour. It is able to run continuously for more than one hour, with a 10-mile range of use. The board is designed to go over various terrains. However, the battery drainsfaster when used on rougher surfaces (but that is to be expected). 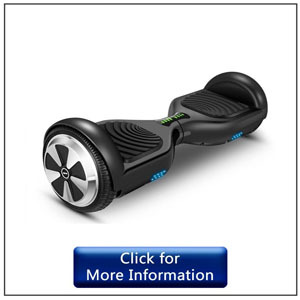 The downside with this unit is that if the battery charge runs out, you will have to carry the board. Now this unit is heavier than a lot of other units. It weighs 31 lbs (14 kilos), which is 50% heavier than some, so it is not really suitable for very young children. However, due to the larger than average size and maximum weight load at 240 lbs (100 kilos), this model is well suited to teenagers and adults. 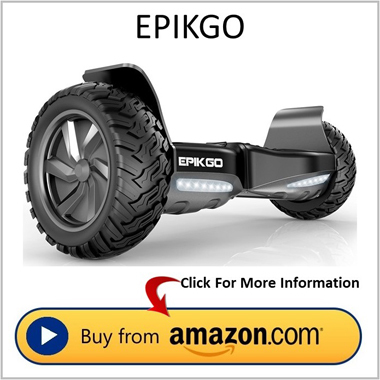 The EPIKGO is perfect for those who want high-performance. With its 400 Watt dual motor, the unit delivers a good amount of power. It is well constructed, robust and technically rather good. It is about 30% larger in physical size than most typical units, but the Epikgo is anything but a typical unit. 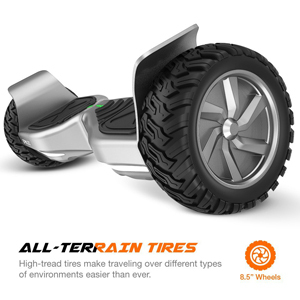 It is fitted with 8.5-inch alloy wheels and rubber (bold tread) tires whichcope very well over most terrains including grass, mud, sand, gravel, uneven surfaces, pavement and road. the Epikgocan climb an incline with a gradient of 18 degrees, which is not bad. Beyond that, it is fully water and dust resitant and is certified to IP56. 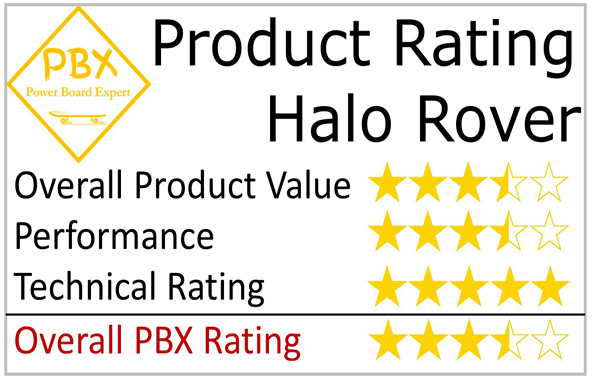 This in our opinion is important, because the IP rating means that the unit is designed to withstand a reasonable amount of water and will keep dust out of the electrics which is often overlooked on hoverboards. Compared to other units, it has more foot space. This makes it comfortable and ideal for adults. You will also find it easier than most other products to control and maneuver. Since the EPIKGO goes faster than many other models, first-time users will appreciate the training level to learn how to use it. It comes equipped with a self-levelling feature to make it easier to use. 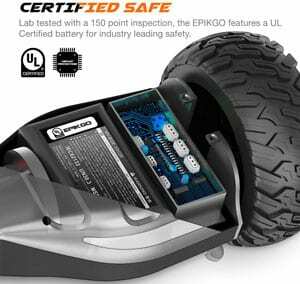 Other safety features include a gyroscope, an acceleration sensor, and a servo-control system. These features are well designed and make it almost effortless to help keep your balance through acceleration. Each unit also has front and signal lights, allowing you to drive safer in darker environments. The Epikgo isn’t equipped with Bluetooth or a smartphone app connection. While not being able to play your favorite tunes out loud is surely not that big a deal, however, for some people it is, so in that case, this model is not an option. 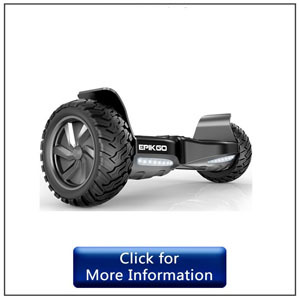 The Epikgo is a very stylish board. Certainly, if you want a cool unit, this one’s a winner. As I said, the build is great, and the attention to detail gets top marks in all areas. The product is 23 inches in length and 9.5 inches in height. The product weight is 31 pounds or 10 kilograms. The maximum weight it can carry is 100 kilograms or 240 lbs. It is powered by a 400-Watt dual motor that can run up to 12 miles per hour. It comes with a rechargeable battery and a power cord. It also has a 12-month limited warranty. EPIKGO is not really your basic unit for the kids. There’s no remote control and besides, it’s a bit on the big side for kids under 8. It is more powerful than most units, has great features and the ability to handle all kinds of terrain makes it a great choice for those looking for a model that delivers that bit more than most other products. In our opinion, although it has a higher price tag than many, it is a worth every penny. OK, so this unit is quite expensive, but it is relative to what you get. A good indication of how good this unit is can be found from the 211 Amazon reviews, of which 90% are 5 star ratings, and some of these comments really show its true worth. In brief, people love it, and rightly so, because it is a fantastic product. 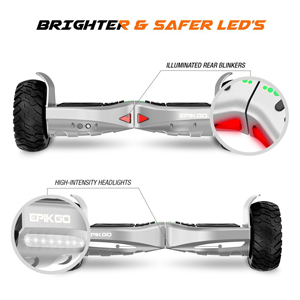 Equipped with trademark Halo Rover technology, the board’s sensors will ensure that you will have the smoothest ride ever. Using its smartphone app through Bluetooth connectivity, you will also be able to remotely control the speed, steering sensitivity, and other features to have a safer and smoother ride. Plus, you can blast your favorite tunes via Bluetooth while riding. The Bluetooth feature and functionality is very good, and far more impressive than on other units. 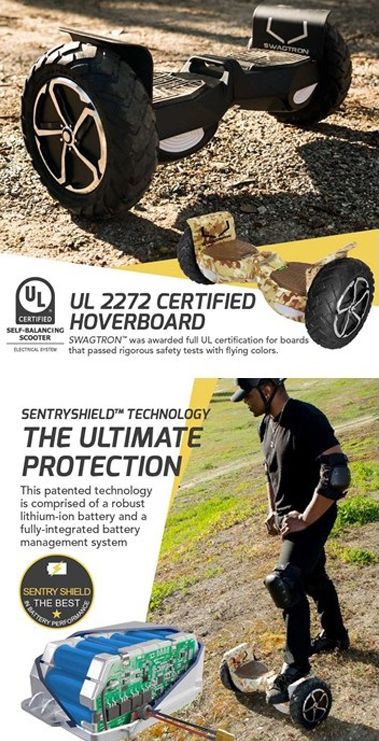 We care about safety above all, which is why we only choose UL 2272 certified models like the Halo Rover. 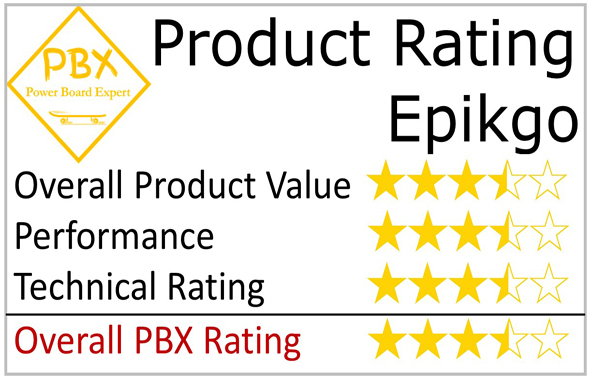 Another certification that this model has passed is the IPX4 water resistance compliance, meaning if you happen to drive through puddles, you won’t have to worry about damage to your board. To power up, you will first need to charge the battery for about 2.5 hours. There is an indicator light that turns green when the device has been fully charged. Once charged, its powerful 400-watt dual motors will be capable of running for 2 hours at 10 miles per hour, or run 10 miles in all. It can also handle uphill gradients of up to 20 degrees. It is an all-terrain model that can go on pretty much any surface includinggrass, mud, sand, gravel, uneven surfaces, pavement and road. However, speed depends on the weight of the user, so heavier adults might find the board slower than normal, but that goes with any board. The Halo Rover is 28 inches long by 8.7 inches wide by 9.5 inches high. It weighs 41.35 lbs and has 8.5-inch high non-flat rubber (bold tread) wheels with aluminum protective guards around the wheels. The maximum load is good and is able to cope with the weight of an adult up to 264 lbs. Unfortunately, there is no choice of colour. 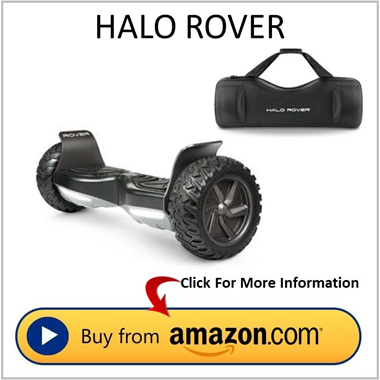 The Halo Rover is only available in black. It does however come with a nice free carry case (also in black). The case is quite sturdy and handy to simply carry the board after use. The unit is quite heavy though, but this is to be expected with the level of features and high-quality components. The Halo Rover is crammed with great technical features. 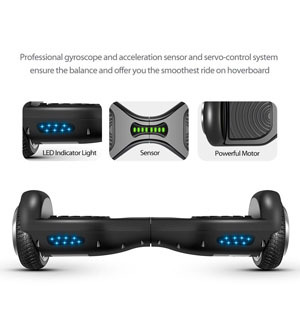 First of all, a gyroscope will help you balancing yourself on the board. The technology identifies the usersorientation using gravity. An acceleration sensor and a servo-control system is built in to the unit enabling it to sense acceleration, and to adjust the balance simultaneously. The design and build of this feature is very good and makes for an effortless ride keeping the user upright and balanced at all times. Another safety feature is the LED headlights these provide a decent level of visibility, making it easier for the user to be seen in lower light levels if using on the streets. Although the LED’s are good, it is not recommended to use these boards in the dark, because they are not headlights. When using the phone app, it is possible to change the mode of the board. It comes in learning, normal and advanced modes, making it easier for beginners to get used to it and for the expert gain a higher level of performance from the hoverboard. You get a standard 12 month warranty, and the customer service / support is very good, if ever you need to contact them for issues on the board, which you probably won’t. IPX4 water resistant compliant, meaning it will not get damaged easily when used in the rain or when it gets wet driving through puddles. Included in the purchase is a black carry case. The product is 28 inches long by 8.7 inches wide by 9.5 inches high. This board weighs 41.35 lbs and has 8.5-inch high non-flat rubber (bold tread) wheels. It is powered by a 400-watt dual motor power that can run for 2 hours at 10 miles per hour, or run 10 miles in all. This unit has the following: gyroscope, an acceleration sensor, and servo-control system. Charging the battery takes about 2.5 hours, and there is an indicator light that turns green when the device has been fully charged. It is capable of Bluetooth connection and smartphone app control. If you are looking for speed, you will have to pay more money. The reason for this is because the motor needs to be more powerful. Think of it like buying a car. If you want a high-performance car, you buy a Ferrari, or Porsche right, and these are costly vehicles. Same with the board, the high-powered motors that achieve best speed cost more money thank the basic standard boards. Generally speaking, the speeds range from 6 miles per hour up to 15 miles per hour. Now that might not sound like a lot, but remember, you are a few inches from the ground, and these speeds will appear fast. Especially at first. When you have got used to the speed, you will doubtlessly be trying out more advanced techniques at speed. If you are adventurous therefore, and you can afford the extra cost, you should go for the more powerful unit, because speed is one thing, but a more powerful motor will enable better uphill climb and a more effortless ride. How Important Is Wheel Size? These scooters come with wheel sizes of 6.5”, 8” & 10”. So why are there 3 different sizes of wheels on different models? The same is true with cars. Small town cars generally have small wheels, and larger SUV’s have large wheels. Large wheels enable a smoother ride and have a better response off road. So off road might be on the beach or across a field for example. Hoverboards can’t cope with extreme ground conditions, but the larger wheel models can cope with much more than the 6.5 inch units. If you only want to use it on the pavement or other smooth surfaces, a 6.5” model will be fine. The advantage of a small wheel unit is that is uses less power, so a small wheel unit will have a longer battery time than a large wheel unit (all things being equal). What you will find however, is that a larger wheel size is generally a better ride, and is my choice of product, but everyone is different, and if price is your main objective, then you will have to go for a 6.5” wheel size model. Don’t expect that unit to perform on more demanding terrains though, because they are not designed for that. 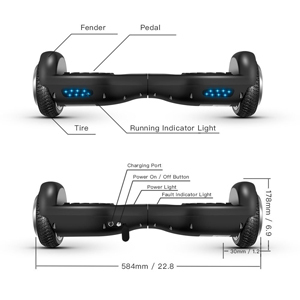 Some hoverboards are Bluetooth enabled, which means to can connect your mobile phone to your board and play your music through the boards onboard speakers. This is probably a feature that is a waste of money. If this is important for you, then you should maybe ask yourself why? You can listen to your music via Bluetooth head phones. If you play music through the units speaker, everyone is going hear it, and will be annoying for people around you. If you are not bothered about that, then of course you can buy a board that is Bluetooth enabled, but you will be paying for a feature that is not in my opinion a feature that is of particular importance, but each to their own. Can Self Balancing Scooters Climb Uphill? 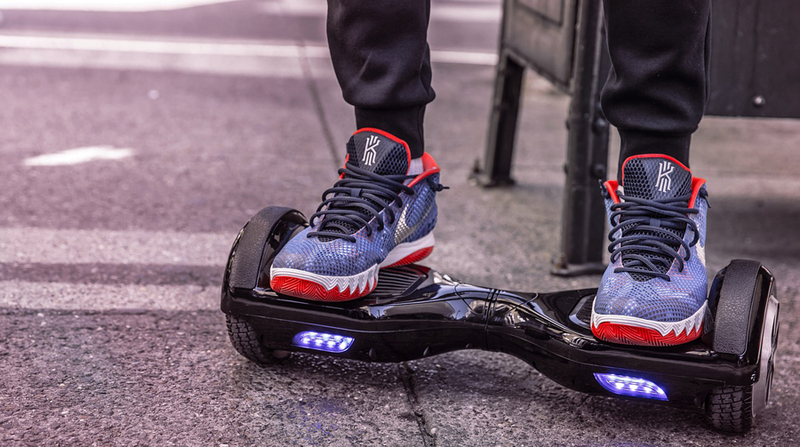 Do Hoverboards Still Catch Fire? A few years ago, when they first came out, there were issues concerning the units combusting. The issue was due to the fact that the battery severely overheated, and as a result ignited, and the unit caught fire. A lot has changed since those days. There are regulations in place and the batteries that are used in the modern hoverboards need to meet a specific standard. The standard, when met, receives a product certification of compliance, and is UL 2272 Certified. 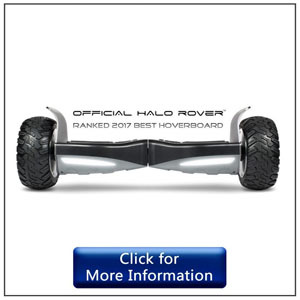 So when you are purchasing a hoverboard, it is important that it is UL 2272 Certified.